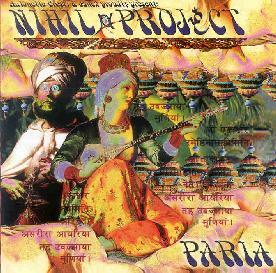 Nihil Project are an Italian ensemble who play an ethnic, dance flavored, generally multi-faceted and often avant-garde brand of psychedelia. The band consists of Antonello Cresti on drums & vocals, Andrea Gianessi on guitar & electronics, Massimo Fantoni on guitar & effects, Michele Staino on bass and Francesco Viani on keyboards. I believe Paria is their second album. "La Realta E La Mia Illusione" opens the set. It's begins with a strange but intriguing combination of Indian influenced chanting and dancey space electronics, which quickly launches into full space dance mode with an Ozric Tentacles flavor. The music is powerful and even though I don't understand Italian, the brief narration provides a dark offset to the more spiritual chanting. An excellent blend of ethnic influences and groove laden space rock. "A.S.C. (Altered State of Consciousness)" is a 15 minute freakout journey full of bubbling effects, trippy 60's styled organ, and plenty of rockin' space. Despite the parade of psychedelic fun along the way there really is a sense of order as the music proceeds down a structured, melodic path. But about halfway through it shifts gears and takes off into a tripped out free-jazz realm that proves to be a progression from the opening sequence into a more chaotic hallucinatory world. This is one of those tracks that grows on you with subsequent listens and reveals new treasures each time. "Sequentia" is similar and is one of the more mellow tracks of the set. "Thelema" begins with a haunting Phantom of the Opera organ intro, but then melts into raga-land with steady tablas, chants and effects, only to shift gears again as it embarks on a potent, theatrically foreboding segment with loud freeform tribal percussion, wailing flutes and a banquet of effects. Very powerful and darkly mystical. "Llanfairpwllgwyngyllgocerychwyrndrobwilliantyslococococh" (ya believe that title?) goes deeper into freakland, with stinging guitar blasts, gurgling electronic effects, a jazzy groove, a King Crimson-like power-prog vibe, Beat styled spoken word in English, and a symphonic choir. Describing this makes it sound all over the place, but these guys excel at combing contrasting elements into a mind-bendingly surreal but cohesive whole. "Electric Dawn" includes some of the most intense rocking moments of the set, but also some of the most delicate. And it all sounds so strange against the repetitive off-kilter rhythmic pattern. "Alienazione Metropolitana" sets the tone for the next few tracks by taking a familiar Beatles riff and mutating it exactly the same way The Residents did many years ago. A wild, freeform bit of tape splicing mania. "La Metafisca Delle Vette" and ".... (Silence)" are similarly avant-garde exploratory collage pieces. In summary, Paria is a challenging listen and requires multiple spins to fully digest and appreciate. I think I enjoyed the first handful of tracks best, as they seem to provide a dose of structure that serves as a foundation upon which the band can explore, construct and play. The last few tracks have much to offer but didn't grab me like the others did. Overall, however, there's some tasty music to be heard here from a band that clearly has multiple interests and isn't afraid to try and bring them all together. If you don't read Italian then email them at: nihil@nihilproject.org.